hiking and camping by yourself, and what you’d do if something happened or you got hurt. Thanks to Isaac Daniel, that world is here. 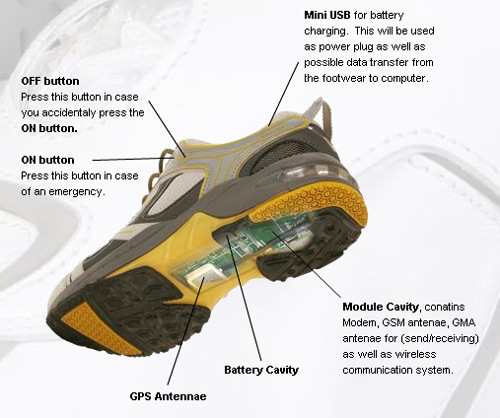 Mr. Daniel is the maker of a revolutionary new way to use GPS: athletic shoes that have a GPS tracker built into them! In 2002, Isaac Daniel had his own scare related to his son. While on a business trip, he received a call from his son’s school saying that his son was missing. Fortunately, his little boy was discovered after having taken an impromptu trip to the restroom, before he ever arrived home, but this personal scare got him thinking… How could he use modern technology to keep his child safe? His solution was a pair of athletic shoes with a GPS tracker embedded in them. If a child wearing these shoes becomes lost (or kidnapped), they simply push a button on their shoe that will alert the ID Conex Location-Based Service Center that they need help or are in danger. From there, the operators at the center can locate the child, thanks to the GPS locator built into the shoes. At that point, authorities and rescue teams can be alerted. Or, if a parent or caregiver needs to locate a child who is wearing GPS shoes quickly, they can call the monitoring service and have the GPS tracker in the shoes activated making it possible for the child to be easily located. As you know, being able to quickly locate a missing person can ultimately save lives. One downside of these shoes is the fact that a child might push the button for fun, at which point the parents would still be liable to pay for the locating service that had been activated. So it will be important to teach children that they are never to push the button on their shoes unless they are lost or in danger. Here’s an online demonstration showing how the GPS shoes work. In addition to GPS shoes for children, they also make GPS sneakers and hiking boots for adult men and women — with the exact same features. These shoes are especially great for those who have memory problems or alzheimers. The built-in GPS technology can be used to locate an individual, if they should wander from their care facility, wander from home, or become lost out in public. I used to work in a nursing care facility, and this happens more often than people realize. Time is of the essence when it does occur, because these individuals can become easily confused, and can be harmed or taken advantage of. Also, if you are a camper or hiker (even if you camp and hike in groups), if one of you has a pair of these shoes on, then it raises the safety level for the entire group. If anyone in the group were to get hurt, you could easily activate the shoes and get help right away. The first GPS sneakers were available for adults in limited release beginning June 2008. The child’s version of the GPS sneakers should be available in Fall 2008. The shoes start at $289 and go up from there. Plus, there is also monthly charge for the GPS tracking service. At first this may seem expensive, but when you think about the peace of mind it can give not just parents, but children knowing that if someone grabs them, or tries to hurt them that they can quickly and easily (not to mention unobtrusively) let someone know that they are in danger, it’s hard to put a price on something so precious. 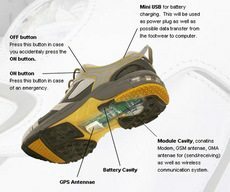 I predict that these GPS sneakers are going to take our world by storm, and change the way we view keeping our loved ones safe forever.